Fruit flies are small, red-eyed, 1/4 inch long flies commonly associated with overripe and fermenting fruits and vegetables. However, fruit need not be present to have fruit flies, as they can originate from other sources. They are the number 1 pest fly in bars and restaurants. 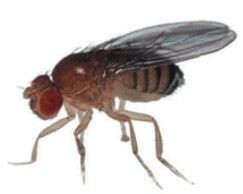 Fruit flies can reproduce anywhere there is fermenting organic matter that stays consistently wet or moist. Like other flies, the fruit flies develop from larvae, and fruit fly larvae must have moist, fermenting organic matter in order to survive. The most likely of such sites in the home is a slow-moving or seldom-used sink, bathtub, shower, or floor drain in which a layer of slime (organic film) has built up above the water line. In restaurants and bars, other moist accumulations of fermenting organic matter are possible and should be considered. These include wet areas under dripping pipes and refrigeration equipment, garbage containers, and discarded bottles and cans. Regardless of where the flies originate, they will be seen at windows and at sinks, as they are attracted to light and to moisture. Female fruit flies lay their eggs on the surface of rotting fruit. These eggs hatch into larvae, which molt twice before becoming full grown. Fruit fly larvae feed on the yeast organisms and fungi growing in the fruit and vegetable materials, and through their feeding efforts, they soon turn their food into a semi-liquid mess. When the full grown larvae are ready to pupate, they leave the rotten fruit for drier areas, usually to the sides of the garbage can. 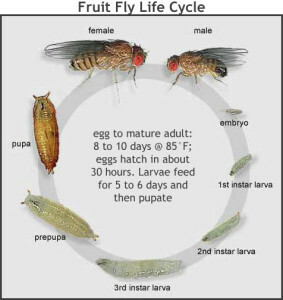 The time required to complete one life cycle is mainly dependent on the temperature of the growth medium and surrounding air; at 64 degrees Fahrenheit, it takes 18-20 days for growth from the egg stage to adult, while at 77 degrees Fahrenheit, only 8-10 days are required to complete the stages of development. Fruit Flies are best controlled by locating and eliminating the source of the infestation. Sprays, fog and traps will capture and kill the adult flies, but control of the larvae and elimination of the breeding area will be the only way to stop them. Persistent presence of adult Fruit Flies indicates the larvae are developing nearby. This is always in the area of decaying or rotting organic matter, especially fruits and vegetables – hence the name fruit fly. Insecticide fogs such as Pyrethrum Aerosol can be sprayed into the air to kill adult winged Fruit Flies. A simple 3 second spray into the air with the products will kill most Fruit Flies within the area. These products can also be sprayed under and behind equipment and in hidden areas, cracks, and crevices. A foam injection Aerosol will provide a much needed Growth Regulator application to cracks, crevices and drains that will kill Fruit Fly eggs and stop the immature larvae from becoming adults. Insecticides sprayed with a hand held pump sprayer under and behind tables, equipment and “over the top” of organic matter such as beer, food, trash etc, will provide control, however, cleaning these areas first and then spraying is recommended. Fruit Fly Traps provide control by capturing the flying adult fruit flies. Don’t be mislead into thinking that these traps will control the population. Fruit Fly traps only trap the adults, they do nothing for the eggs or immature larvae. For control of eggs and immature larvae, you first have to find the area, and then use an Insect Growth Regulator (IGR). For long term control of fruit flies consider using a glass fruit fly trap that can be dumped and refilled on a regular basis. Floor Drains can also provide a source for Fruit Flies. One way to check individual drains is to cover the drain with a plastic film such as “Saran Wrap” taped to the floor or fixture. If the flies are breeding in that drain, the adults will accumulate underneath the film within a day or two. The most important thing to remember in Fruit Fly Control is that the flies are there because there is an attraction and a source for them to breed. Once the breeding areas are reduced or eliminated, trapping or killing the adults becomes very easy. 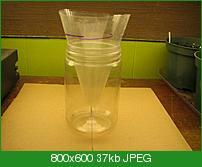 Make a fruit fly trap. Get a jar and make a funnel. (can be paper or plastic) Cut your funnel so that when inverted into the jar, the end is about an inch from the bottom of the jar. Mix 1/4 cup apple vinegar, 1 table spoon sugar and add a few small pieces of apple or banana. Mix and pour in jar. Add water (if needed) until mixture is 1/2 1nch from the bottom of funnel. Leave jar set out. Flies will get in but can’t get out. Take outside, remove funnel, flies fly away. Reinstall funnel, set out, trap flies, repeat.